I feel as if I have too much stuff to do. The most important thing approaching on the horizon is my phd viva – it’s happening next week. I’ll post about that, whatever happens (go here to find out). Over the last few days Dave Martill and I dealt with the page proofs for in-press papers we’ve done on Kimmeridge Clay dinosaurs and azhdarchoid pterosaurs, and in between editorial work I’m writing manuscripts on new Cretaceous theropod specimens. Anguid lizards and monkeys are also high on the list of priorities, and I’m excited by the recent description of the new North American pachycephalosaur Dracorex hogwartsia, though don’t ask me what I think about the name. For now, we go back to the subject initiated in the previous post: the amazing late survival of non-mammalian synapsids, a subject that I’ve planned to cover since... well, I don't recall, but I know I mentioned it a while back. By the way, the title I previously used ('late-surviving non-mammalian synapsids') no longer applies as some of the taxa discussed here are not non-mammalian synapsids, but are in fact basal mammals. We do begin with alleged non-mammalian taxa however. The most controversial of these ‘Mesozoic survivors’ is a diminutive and enigmatic animal from Upper Palaeocene North America: Chronoperates paradoxus, described by Fox et al. (1992) for a partial mandible and some isolated teeth from the Paskapoo Formation of Alberta. 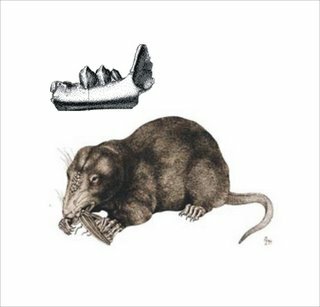 With a lower jaw that (when complete) would have been less than 30 mm long, and with tooth crowns about 2 mm tall, Chronoperates would have been shrew-sized. While clearly synapsid in identity, Fox et al. (1992) noted that several features made this taxon amazingly archaic. Firstly, the medial surface of the dentary possesses trough-like concavities that Fox et al. interpreted as areas for the articulation of post-dentary bones. Crown-group mammals lack these, but they were of course widespread in other synapsids. Secondly, the teeth are unusually tall and laterally compressed, and with an archaic multi-cusped crown morphology. Superficially, the teeth resemble those of Triassic non-mammalian cynodonts like Therioherpeton. Thirdly, the tooth enamel of Chronoperates is reportedly of pseudoprismatic type, a morphology not present in placental mammals and thus by inference expected in non-mammalian synapsids. Among synapsids, this combination of features is reportedly only seen in non-mammalian cynodonts, and Fox et al. concluded that Chronoperates must have been one of these: the first of them (at the time) to come from post-Jurassic strata. If this is correct, then the geological range of non-mammalian cynodonts had just been extended by about 100 million years, and it’s for this reason that the name Chronoperates means ‘wanderer through time’ (since 1992, Upper Jurassic and Cretaceous non-mammalian cynodonts have been described, thereby shortening this gap, but I don’t want to cover them here: wait for next post). All in all, the case doesn’t sound too bad and initial reports were quite positive: wow, mammals weren’t the only synapsids that survived into the Cenozoic after all, and non-mammalian synapsids had been there all along, hiding in the proverbial shadows (Novacek 1992). Fox and his colleagues have stuck to their guns, and in recent publications have continued to regard Chronoperates as a non-mammalian cynodont (Scott et al. 2002). How was it that post-Jurassic basal cynodonts had remained undetected for so long? Fox et al. proposed that the small size of these specimens, their rarity, their possible restriction to northerly regions, and a lack of the right kind of sampling, might explain their previous absence from the fossil record. Their proposal was soon criticized. In a rebuttal, Hans Sues (1992) argued that all of the features employed by Fox et al. (1992) to demonstrate non-mammalian status for Chronoperates were problematical. Sues argued that the teeth of non-mammalian cynodonts were actually pretty different from those of Chronoperates, that Mesozoic mammals didn’t share pseudoprismatic enamel with Chronoperates, and that the interpretation of the troughs on the dentary as probable attachment areas for post-dentary bones was unconvincing. He concluded that ‘the fossils currently available do not justify classification of Chronoperates as a non-mammalian cynodont’ (p. 278). Furthermore, while Fox et al. (1992) were careful to exclude other possible contenders (including crocodyliforms, pterosaurs, lizards, xenarthrans and mesonychians) there were a number of Palaeogene mammal groups that they didn’t exclude, and it would have been more convincing had it been shown that these taxa could also be eliminated from comparison (H.-D. Sues, pers. comm.). But if Chronoperates isn’t what Fox et al. said it was, what is it? A few possibilities have been suggested, or hinted at, in the literature. In their Classification of Mammal: Above the Species Level, McKenna & Bell (1997) classified Chronoperates as a basal holotherian (Holotheria = kuehneotheriids, spalacotherioids, dryolestoids, therians etc.). They noted that its position is ‘dubious, even at this level, but not a nonmammalian cynodont’ (p. 43). So, while they didn’t agree with Fox et al. that Chronoperates was non-mammalian, they still thought that it was closest to taxa that were otherwise Triassic and Jurassic. Well, hey, that’s about as exciting as the possibility that Chronoperates might be non-mammalian. I mean: a relative of kuehneotheriids and gobiconodontids that survived into the Cenozoic? It would be a big deal. This possibility (that Chronoperates is a late-surviving basal holotherian mammal) has been hinted at by some other workers. In a study on the distribution of an ossified Meckel’s cartilage in basal mammals, Meng et al. (2003) noted that the medial dentary scar seen in Chronoperates might not house post-dentary bones, as Fox et al. proposed, but instead a persisting Meckel’s cartilage. Now, if Chronoperates did possess a Meckel’s cartilage, this would be a first for a post-Mesozoic synapsid, and would further support ideas that Chronoperates is actually a late-surviving basal mammal. And as I noted above, this would be very exciting. For now, this is all we know of Chronoperates, and it remains a controversial enigma, and possibly an exciting anachronism. So whatever it is, Chronoperates remains enigmatic and poorly known. Quite the opposite is true of the docodonts, a relatively successful and long-lived group of basal mammals that were long known only from the Late Jurassic North American form Docodon Marsh 1881. Docodonts had characteristically broad molars and a complex dentition that appears to have been rather like that of tribosphenic mammals, and both the homology of their tooth cusps, and their affinities to other mammals, have proved controversial. In their recent phylogenetic review of Mesozoic mammals, Luo et al. (2002) found docodonts to be way down near the base of Mammalia ‘despite their precociously specialized dentition’ (p. 16). Most other workers seem to agree with this. Early Cretaceous docodonts weren’t described until 1928 when G. G. Simpson reported Peraiocynodon inexpectatus from the Purbeck Limestone of England. Peraiocynodon is quite similar to Docodon and a number of workers have regarded the two as congeneric. Since the 1970s, several additional docodont taxa have been described from the British Middle Jurassic (see Sigogneau-Russell 2003 for review) and Middle Jurassic forms are also known from Kyrgyzstan, China and Siberia. An Upper Jurassic form, Haldanodon, was described from Portugal in 1972, and in 1994 an Upper Jurassic Mongolian form, Tegotherium, was described. A second Early Cretaceous docodont, Sibirotherium, was named by Maschenko et al. (2002) for material from Siberia. Sibirotherium shares some characters with Tegotherium, and both taxa have been united in the clade Tegotheriidae. In its 2002 description, Sibirotherium was said to be the youngest reported member of the group. Incidentally, I have a post planned about Jurassic docodonts, as their functional morphology and ecological diversity is interesting. But here we come to the surprise. Were docodonts all but a distant memory by the Late Cretaceous? Well, in 2000 Rosendo Pascual et al. claimed that, no, they weren’t, but that they had actually managed to hang on until the very end of the Late Cretaceous. Pascual et al. (2000) described how the poorly known Cretaceous mammal Reigitherium bunodontum, originally described by Jose Bonaparte in 1990 as a dryolestoid, appeared in fact to be a bona fide docodont, and a very late surviving one. Discovered in the Campanian-Maastrichtian La Colonia Formation of Patagonia, if Reigitherium were a docodont, it would show that they had survived almost to the end of the Cretaceous, and - if they’d been lucky - they might even have scraped through into the Cenozoic. Pascual et al.’s proposal would also extend the docodont record by a minimum of 30 million years given that Sibirotherium might be as young as Aptian-Albian. Alternatively, Sibirotherium might be as old as Berriasian-Valanginian, in which case Reigitherium would extend the docodont record by about 55 million years. Either way, it would be significant. But is Reigitherium really a docodont? According to an abstract produced by Rougier et al. (2003), no it isn’t, as new material from the La Colonia Formation later showed that Reigitherium really was a dryolestoid, as originally identified by Bonaparte. Technical details of the molar cusps and roots, and the tooth count, better match those of dryolestoids more than docodonts, and in fact Reigitherium appears particularly closely related to the Palaeocene dryolestoid Peligrotherium, with both being united by Rougier et al. (2003) in the dryolestoid clade Reigitheriidae. Oh well. I confess that I had totally missed this abstract and didn’t know of it until David Marjanovic pointed it out to me (see comments, below). The scepticism that some Mesozoic mammal workers had about the alleged docodont status of Reigitherium might explain why Maschenko et al. (2002) appeared to ‘overlook’ the 2000 reidentification of Reigitherium as a late-surviving docodont, hence their claim that Sibirotherium was the youngest known docodont. The image above (sorry again for the poor resolution) shows the holotype jaw of Chronoperates together with a life restoration of the Jurassic docodont Haldanodon (no life restorations of Reigitherium available, unfortunately). Again, both images can be pulled from various places on the web. UPDATE (added December 2006): I can now reveal that this post was inspired by rumours of a Mesozoic-grade mammal that managed to survive on New Zealand until the Miocene. The fossils concerned were finally published late in 2006 and concern a basal form close to multituberculates and the base of Trechnotheria (the mammal clade that includes dryolestoids and therians): free pdf available here. Palaeontologists aren’t very good at keeping secrets, and the New Zealand animals have been whispered about for years. For the latest news on Tetrapod Zoology do go here. Fox, R. C., Youzwyshyn, G. P. & Krause, D. W. 1992. Post-Jurassic mammal-like reptile from the Palaeocene. Nature 358, 233-235. Luo, Z., Kielan-Jaworowska, Z. & Cifelli, R. L. 2002. In quest for a phylogeny of Mesozoic mammals. Acta Palaeontologica Polonica 47, 1-78. Maschenko, E. N., Lopatin, A. V. & Voronkevich, A. V. 2002. A new genus of tegotheriid docodonts (Docodonta, Tegotheriidae) from the Early Cretaceous of West Siberia. Russian Journal of Theriology 1, 75-81. Meng, J., Hu, Y., Wang, Y. & Li, C. 2003. The ossified Meckel’s cartilage and internal groove in Mesozoic mammaliaforms: implications to origin of the definitive mammalian middle ear. Zoological Journal of the Linnean Society 138, 431-448. Novacek, M. J. 1992. Wandering across time. Nature 358, 192. Pascual, R., Goin, F. J., González, P., Ardolino, A. & Puerta, P. F. 2000. A highly derived docodont from the Patagonian Late Cretaceous: evolutionary implications for Gondwanan mammals. Geodiversitas 22, 395-414. Rougier, G., Novacek, M. J., Ortiz-Jaureguizar, E., Pol, D. & Puerta, P. 2003. Reinterpretation of Reigitherium bunodontum as a Reigitheriidae dryolestoid and the interrelationships of the South American dryolestoids. Journal of Vertebrate Paleontology 23 (Supp. 3), 90. Scott, C. S., Fox, R. C. & Youzwyshyn, G. P. 2002. New earliest Tiffanian (late Paleocene) mammals from Cochrane 2, southwestern Alberta, Canada. Acta Palaeontologica Polonica 47, 691-704. Sigogneau-Russell, D. 2003. Docodonts from the British Mesozoic. Acta Palaeontologica Polonica 48, 357-374. Sues, H.-D. 1992. No Palaeocene ‘mammal-like reptile’. Nature 359, 278. Guillermo Rougier, Michael J. Novacek, Edgardo Ortiz-Jaureguizar, Diego Pol & Pablo Purerta [sic -- Puerta? ]: Reinterpretation of Reigitherium bunodontum as a Reigitheriidae dryolestoid and the interrelationships of the South American dryolestoids, SVP meeting abstract 2003, supplement to Journal of Vertebrate Paleontology 23(3), 90Af. "Eighteen mammalian species have been named from isolated teeth and fragmentary jaws collected in the Late Cretaceous fauna of [the] Los Alamitos formation (Campanian-Maastrichtian), Patagonia, Argentina. Until recently most taxa from Los Alamitos have been interpreted as derived members of a dryolestoid radiation in South America and perhaps Gondwana. Based on a tooth-bearing jaw from the Upper Cretaceous La Colonia Formation, the original attribution of Reigitherium to dryolestoids was subsequently challenged and relocated to Docodonta. If so, Reigitherium would be the only [non-initial] Cretaceous docodont worldwide and the sole record for the group in the Gondwanian [sic] continents. New materials of Reigitheriidae from [the] La Colonia Formation and of the Paleocene dryolestoid Peligrotherium tropicalis [sic -- must be changed to P. tropicale!] indicate that: 1) The original attribution of Reigitherium to Dryolestoidea was correct. The main lingual lower molar cusp is homologous with the protoconid and the buccal cusps result from the elaboration of the cingula, as those present in mesungulatids [which are K dryolestoids from SA]; contrary to known docodonts there are no postdentary bones in Reigitherium; 2) Reigitherium and Peligrotherium are more similar to each other than they are to mesungulatids and can be united under Reigitheriidae. Features uniting them are the presence of accessory buccal cusps in the upper and lower molariforms, development of the cingula, so as to approximate in height the main crown cusps; strong reduction of the buccal cusps in the upper molariforms with a dominant paracone, and a sloping buccal margin of P2-M1; 3) Both Mesungulatidae and Reigitheriidae have strongly developed cingula, anteroposteriorly compressed roots, and where tooth count is known, they have four molariforms that decrease markedly in size posteriorly. Mesungulatidae and Reigitheriidae are likely sister-groups." Dammit. I had heard rumours that Reigitherium had been placed back among the dryolestoids, but I'd missed the Rougier et al. JVP reference. Many thanks for this. I'll update the blog accordingly in the near future.. and then no-one will ever know. Mu-ha-ha (hmm, another spec-world reference). I've been told by the Spec community the proper way of Japanese videogame laughter is "Mu mu mu mu". Don't ask me why.